Bundle Up – Dress for the expected cold-weather conditions. Two tops and running tights are recommended. 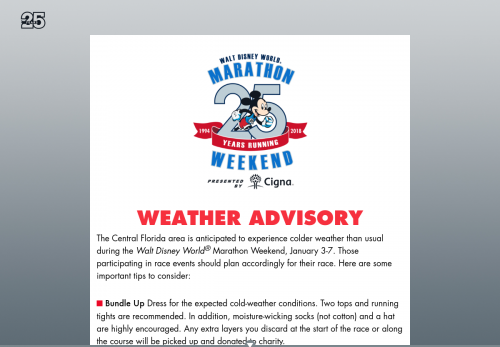 In addition, moisture-wicking socks (not cotton) and a hat are highly encouraged. Any extra layers you discard at the start of the race or along the course will be picked up and donated to charity. Protect Your Skin – Even though it is cold, be sure to apply sunscreen and lip balm to help protect from the sun and wind. Dry Off – When you are finished with your race, change out of your wet clothes as soon as you can or get to your car or bus. Hydrate – Even though it may be cold, don't forget to drink water and Powerade to stay hydrated on the course. Drink room temperature water if you are cold. Know the Danger Signs – This week’s cold temperatures can lead to frostbite and hypothermia. Symptoms include numbness, tingling or aching, and bluish or pale skin. If you experience these, get to the nearest medical tent on the course or ask any runDisney volunteer to notify the medical team. As a reminder, all medical stations will have the appropriate flag color displayed according to existing conditions. For more information, please reference the Event Safety page in the Digital Event Guide. Any adjustments to the race are at the discretion of the Event Management team and are for everyone's safety. All of us at runDisney hope you have a safe, magical run!